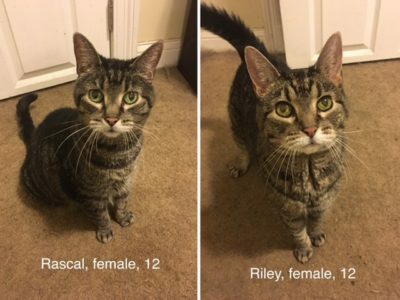 I have two very sweet cats that need to be rehomed. I am recently divorced and have to move and I unfortunately cannot take them where I’m going. In addition, I have a dog that is not gentle with them and it’s in their best interest to be in a home where there are no dogs or at least small, gentle dogs. They do not get along that well with other cats although I did have a third cat at one time and they did live together peacefully for years, so it depends on the situation. They are sisters and ideally, I’d like them to be adopted together if possible. They’ve always been together. Attached is a picture of them. I am moving March 18 and need to find a no-kill shelter or home for them prior to that. Please let me know if you can take them in.